Another exploration with interactive acrylic and ‘drawing with a brush’. Here there was time, about 50 minutes in all, to introduce white with the umber and go beyond a basic wash-in to add a little loose modelling on the back and a touch of detail in the profile. A fairly quick wash-in experimenting with interactive acrylic paint, I found it very freeing to splash around with water, rather than turps or mineral spirits which are both costly and toxic, and to be able to reactivate the paint when touch dry, more like oils. I’ll continue to play around with this medium to find out how it performs in other ways. 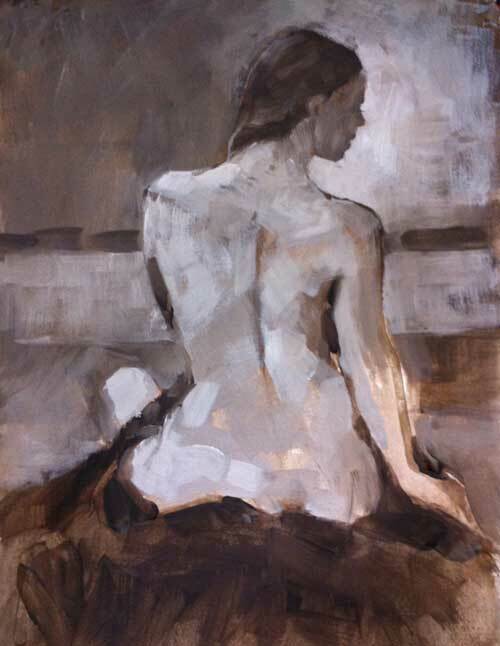 This is a very quick value study going straight for the light, middle and dark tones and their relationship to each other across the figure and through the space. 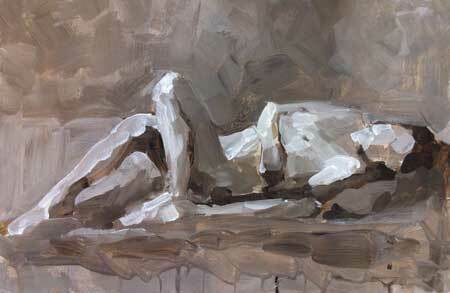 Very immediate using a big brush with just white and umber acrylic paint…strong daylight falling onto the model from the studio window…and little time to think! Is it a painting…or a drawing in paint? I’ve been drawing but haven’t photographed the most recent ones yet, so here’s another wash-in of the previous pose seen from another angle. I prefer the other one. It’s more dramatic. I love the challenge of a dramatic pose like this. The red lines were a way of redefining and checking my drawing. The use of a strong Cadmium red was an experiment, partly to make the marks stand out against the Umber so I could see the alterations clearly but also to increase the drama and energy of the image. Another wash-in. The pose is quite similar to the previous one, and the thing I struggled with in both of them was the model’s left leg which looks in each case like it somehow doesn’t belong. No matter how much I measued and checked that leg persisted in looking disturbingly unattached. It’s something to do with the viewer’s angle in relation to the pose and the weight of the hip sinking into the mattress and I just couldn’t get either of them to look right. I honestly think a photograph would have looked just as odd. Otherwise I quite like this as a study. This was an experiment with an Umber wash-in, which is a traditional way to begin an oil painting, though I think how I’ve done it probably isn’t very traditional. But it is very washy. And drippy. 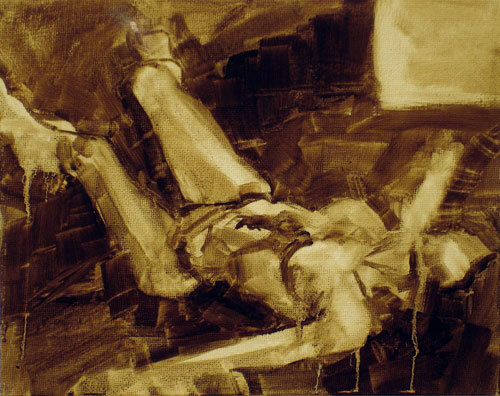 There’s a wonderful freedom working this way which is essentially drawing with a brush. The oil paint, thinned with genuine turps, can be pulled and pushed around for quite a long time before it dries. This would be the first layer of a painting, describing the general shapes and values. The next stage would be to paint the scene again on top of this layer again using monochrome values, but with opaque paint. The third stage, when that second layer is dry, is to add colour, and finally the highlights. Oil paint can take days to dry so this is potentially quite a long process. 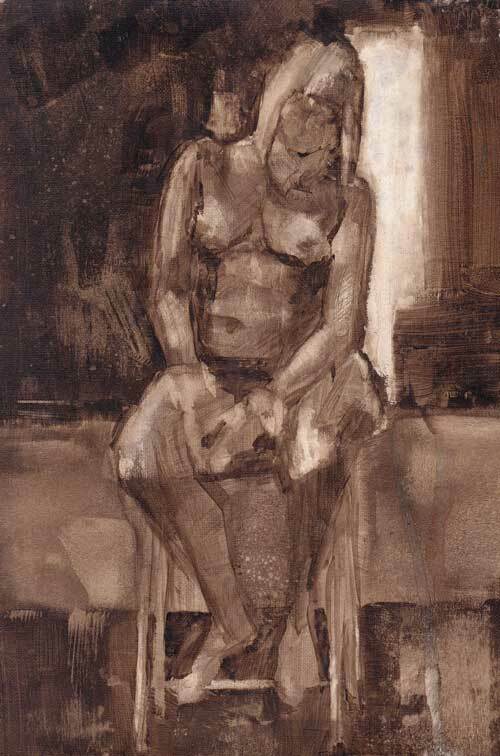 I've recently returned to life drawing as a regular practice to develop my drawing skills and also for the deep immersion in the intimacy of seeing that’s available from this challenging process. I'm posting some of my drawings and discoveries here as a way to observe and record my progress. All images on this blog are © Dee Berridge. All rights reserved.